Every year, the capitol would put on the Hunger Games. The Hunger Games was when two chosen tributes would compete for victory and wealthiness. In these games, there could only be one survivor to be the winner. Katniss, the main character, walks with her family to the reaping, where names are picked to determine who the tributes were going to be. Effie Trinket, the announcer and trainer, picks out a slip with the name of Katniss’s younger sister, Primrose. Katniss volunteers for Prim and takes her place. The second slip is pulled with the name Peeta. Peeta had once saved Katniss and Peeta from dieing of starvation. Katniss and Peeta say their goodbyes to their families and friends before they are sent off to training with the other tributes. Katniss learns that her strength is archery, while Peeta learns that his is lifting weights. When Katniss and Peeta enter the games, they are separated and have to survive on their own with a limit amount of supplies. Katniss allied with Rue, a young girl and they worked together to survive. Rue was soon killed by a tribute and Katniss was left alone. Half way through the game, the gamemakers announced a new rule, that there could be two winners, but they have to be from the same tribute. When Katniss hears this message, she started on her search to find Peeta. 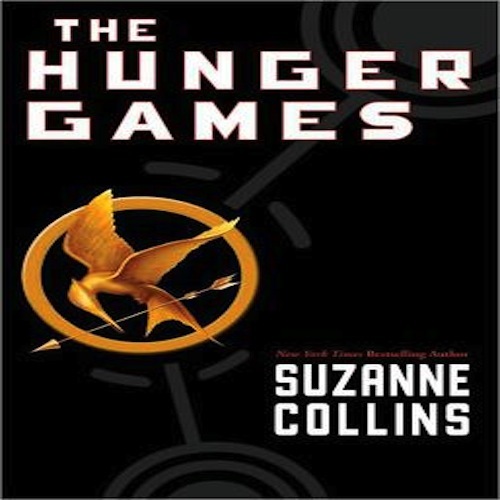 When I first heard about the The Hunger Games book, it did not catch my attention, and I did not intend to read this book. I decided to read this book when Mr. Oncay mentioned that this book was a great book to do for the book review. When I started to read the first few chapters, I knew that I was wrong. The Hunger Games is a brilliant book. This book is full of adventure and the description is very clear, which makes you feel as if you are in the story. The language is easy to understand, but there are a few vocabulary words that needed to be searched up. This book is great for teens. Overall, I would rate this book 10 out of 10. 1. When Prim’s name was called during the reaping, how did Katniss act? 2. When Peeta’s name was called, Katniss knows that she has seen him before. When has she seen him before? 3. Why did Katniss and Peeta have a huge crowd cheering for them during the opening? 4. When Katniss had to perform archery, why did she shoot the arrow through the apple in the pig’s mouth? 5. During the interview, who was the girl Peeta was talking about that he liked? 6. Why did Katniss retrieve for the backpack instead of the bow and arrows? 7. Why did the Career tributes let Peeta join them? 8.Who helped Katniss escape from the Careers and why? 9.Who does Katniss ally with and why? 10. Right when Katniss was finished with burning the Career’s food what happens to Rue? 10a. Rue was caught in a net and then struck by a spear thrown by a boy in district 1. 11. Where does Katniss find Peeta? 12. Who saves Katniss when Clove captures her and threatens to kill her? 13. Katniss and Peeta run out food, so they were weak and were starving. Who sends them food? 13a. Haymitch sends Katniss and Peeta a whole feast when Katniss acted as if she was madly in love with Peeta. 14. What do the Gamemakers send to the three last tributes to make the game go faster. 14a. The gamemakers send mutts, disguised as the previous tributes, who go after Katniss, Peeta, and Cato. 15. When the Gamemakers announce that only one tribute can win the games, how does Katniss and Peeta react? 15a. Peeta tells Katniss to kill him, but she refuses, so they decide to both eat poison berries. The gamemakers stop them before they both had killed themselves.